No craft today, but I do have a fun video of my field trip to JoAnn’s as well as a sneak peak of the pieces of tomorrow’s project for you! Anyway, today I went to JoAnn’s after work to pick up a few things for my upcoming projects. (with my 20% off coupon, whaaaat!) I got feathers, a couple yards of cotton prints, some striped flannel and, of course, a couple remnants. I’ll unveil those to you at a later date. =D Right now, I just want to share my JoAnn adventure with you. It’s a wonderland, I tell you. I’ve spent quite a few hours there these last few weekends and I still haven’t explored the whole store! Any guesses as to what I’m making? We’ve got black and white pinstripe poplin, red polyester, blue floral cotton and two patterned swatches (free ones I got in the mail!) (Hint: the title of this post is a big clue!) 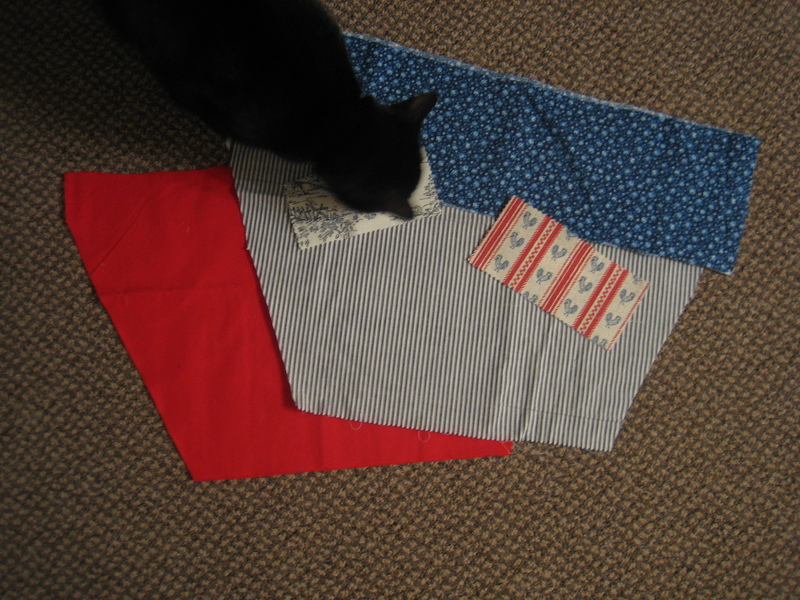 Also, there is one more piece I haven’t yet cut because I can’t decide which fabric to use. =D Stay tuned for this one tomorrow!